I might have touched a little about UX designer, how we input values and come up with strategic planning and solving challenging problems. As well-rounded as that sounds, we are, in the end, human after all. 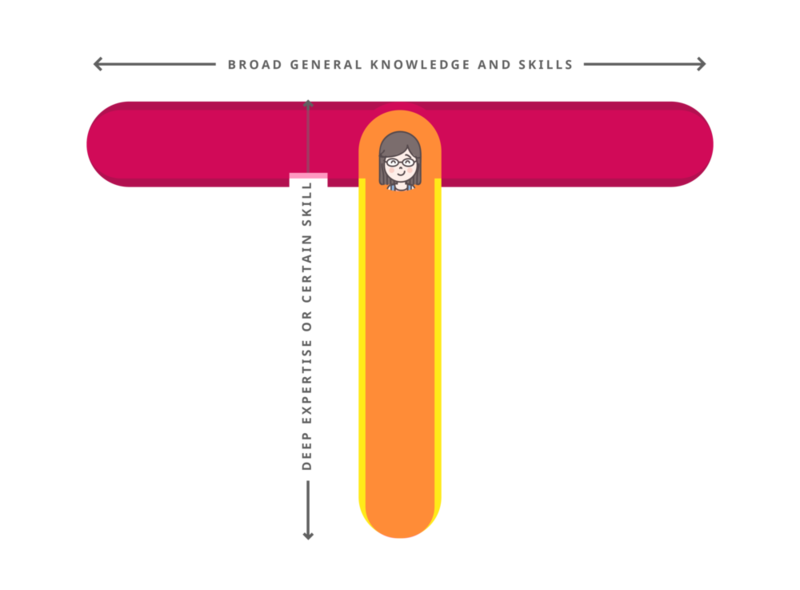 We know quite a lot, as the school tailored as in becoming, but we each need to develop strong skills set. A lot might refer this as a “T-shape” model. In my case, I was educated on a relatively broad spectrum. I had to take psychology, sociology, philosophy, science and other “not quite relevant” courses to develop our knowledge horizontally. So we understand and develop the sense of another profession besides ours. However, I might encounter a lot of courses and knowledge, a lot of them are quite superficial. Therefore, it is time for us individually, take the ownership to develop. Find an interest or passion and deepen that knowledge lane. And that’s when and how we grow ourselves vertically. The role works on all of us (UX designers). We know a lot, but not that much. Therefore, this is when there are other areas of expertise that we strengthen ourselves in and market that. Supposedly, we each carry a defined skill, and with an open and growth mindset, we help and give constructive feedback to one another. 🤔 The downside and struggle of working in a corporate, is the hierarchical format development, less of a horizontal growth.